There are 557 patients on trolleys in hospital emergency departments or on wards waiting on admission to a hospital bed, according to the Irish Nurses and Midwives Organisation. University Hospital Limerick is the worst affected with 76 patients on trolleys. There are 41 patients on trolleys at Cork University Hospital and 34 in University Hospital Galway. The INMO said 394 patients are waiting in emergency departments, while 163 are on wards or elsewhere in hospitals around the country. The Health Service Executive's TrolleyGar figures - which only count those waiting for admission in emergency departments, put the national figure at 405 patients, up by nearly 8% on around the same time last year. The HSE warned last week that the St Patrick's weekend would be a busy time for emergency departments. Meanwhile, the INMO has also criticised plans by University Hospital Limerick to close an in-patient ward, with the loss of 17 medical beds. 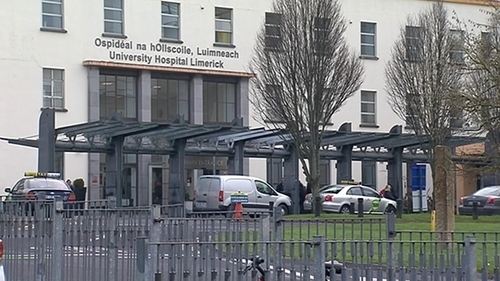 The union said University Hospital Limerick is already the most overcrowded hospital in Ireland. The hospital said the closure of the 17-bed unit is to facilitate the completion of works on the new fracture unit. It said staff were fully involved in this process, with various teams presenting business cases on optimal use of the old emergency department. It said the aim of the process was to open a new fracture clinic in a portion of the old emergency department.